The requirements listed below are minimums. Please keep in mind that the instructor of the class may require more than what is posted. *Students who train at Summer Camp only can test up to green belt rank. *In order to test for purple belt and higher, student MUST attend weekend and / or evening classes year-round. Sparring: student must be able to effectively incorporate hands and feet into their fight. Student must demonstrate strong defensive and offensive skills during their fight. Master Form: Student must be able to perform moves 1-6 without stopping. Student will also be graded on direction, order, targets, & stances for each move individually. ***Student must be able to tie belt correctly by this rank. 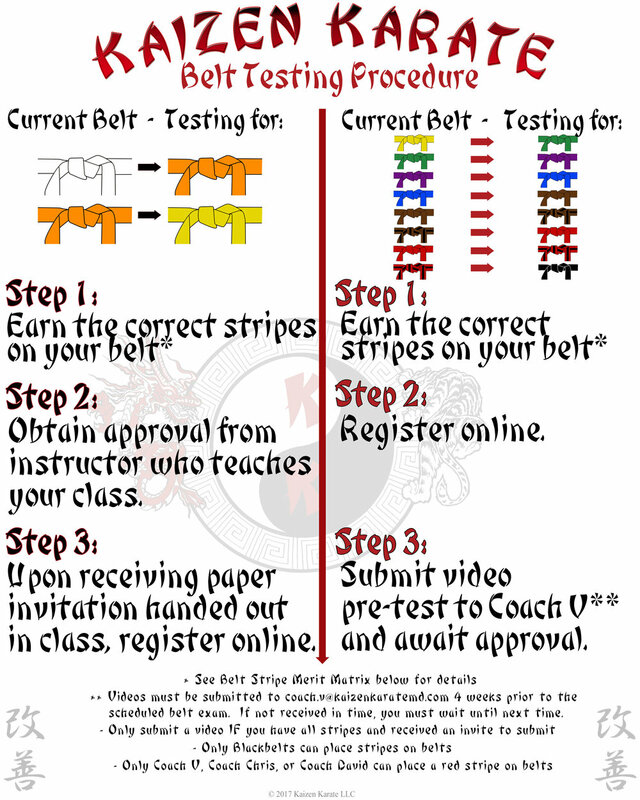 Belt must be worn at all karate activities & must be worn with uniform and / or Kaizen Karate t-shirt and pants. Sparring: student must have tight guard during their fight. Student must have the ability to have total control of fight when sparring students green belt and below. Student must be able to demonstrate excellent control when sparring all levels. Master Form: Student must be able to perform moves 1-13 without stopping. Student will also be graded on direction, order, targets, & stances for each move individually. Master Form: Student must be able to perform moves 1-21without stopping. Student will also be graded on direction, order, targets, & stances for each move individually. Master Form: Student must be able to perform moves 1-30 without stopping. Student will also be graded on direction, order, targets, & stances for each move individually. Sparring: student has the ability to score "at will" during fights when fighting students of same belt level or below. Master Form: Student must be able to perform moves 1-40 without stopping. Student will also be graded on direction, order, targets, & stances for each move individually. Sparring: student has ability to score at will and control any fight when sparring students of equal or lower rank. Student has fought with master instructor or other black belts and demonstrates excellent control and mastery of all techniques. Master Form: Student must be able to perform moves 1-55 without stopping. Student will also be graded on direction, order, targets, & stances for each move individually. Student has strong understanding of principles and concepts of all 55 movements in kata & can perform all moves "on the body" efficiently. *Student has demonstrated that they have complete control over themselves physically & emotionally.